January 14, 2010 May 31, 2012 Nefer Khepri, Ph. D.
This is my second of 3 blog entries about Houmas House. I can’t get them to post in the intended order for some reason (that being that I’m new to blogging and don’t know what I’m doing! ), and I apologize for the confusion. I’ve gone in and edited them so that each entry stands on its own. During the guided tour of Houmas House one of the rooms we were allowed to enter is known as the Billiards Room. This is where the men would have hung out while the ladies would retire to the “Lady’s Palor” in the room next door. My intention here was to photograph the lovely fireplace, mantle, and mirror. To put the photo in perspective, I was standing about 9 feet to the left of the fireplace, at an angle to it. If you look at the lower right-hand corner of the picture you can see the dark mahogany edge of the billiards table, which was about 2 1/2 feet in front of the fireplace. I’ve attempted to draw arrows to the strange things that appeared in this picture. When I looked at my pictures I immediately noticed the smudge on the mirror in the center of the upper third. I figured it had been left there by a maid while cleaning. Yet, try as I may, I could not remember if I had seen a smudge on that mirror. I was pretty sure a smudge was not visible. However, it did cause me to linger and what I saw next completely blew my mind. In the lower left-hand corner of the mirror you can see the back of a man”s head, neck, and right shoulder. It also appears that this gentleman is transparent! There were three men in that room: my husband (who is a strawberry blonde so we can eliminate him as a possibility immediately), a man from New York who was there with his wife (he did have dark hair, but it was wavy and flecked with gray, plus he was wearing a black short-sleeved t-shirt that doesn’t match up with the suit the man in the mirror is wearing), and our tour guide, Kevin (not the same person as the property’s owner, Kevin Kelly). Now, Kevin did have on a white long-sleeved shirt and a black vest. Plus, he does have short, dark hair as does the man in the mirror. However, Kevin had been wearing a hat that he never removed for our entire tour, plus his long white sleeves were quite apparent, so again, his attire does not match the dark suit the man in the mirror is wearing. 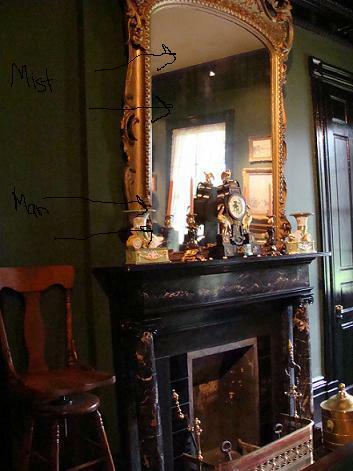 Futhermore, if you go back and look at the full image you can see that in order to cast that type of reflection the man would need to be standing directly in front of the fireplace with his back to the mirror. I emailed this image to Kevin Kelly, who told me he was quite perplexed as he does not believe in ghosts. He confirmed two important things. Firstly, there is NO smudge on that mirror. So, that misty image is something that was in the process of manifesting as my camera took the picture (I have a Sony CyberShot digital camera & had it set for auto-exposure so my flash would not go off). 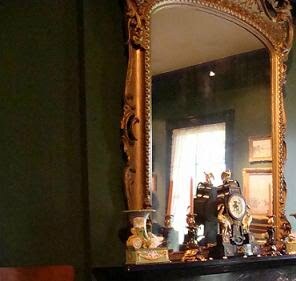 Also, he pointed out that in order for the man’s reflection to appear as it does in the mirror he would have to have been standing inbetween the fireplace and the billiards table. He had his staff attempt to duplicate this reflection and there is nowhere else in the room one can stand in order to cast that type of reflection in the lower left-hand corner of the mirror, except right in front of it. Mr. Kelly was also the one to point out to me the figure in the mirror is transparent. In order for this to be a person casting their reflection they would need to be standing between myself and the fireplace. As you can clearly see from the original picture there is no one there! While preparing this to go up on my blog I was examining other photos and have since discovered another image that involves a picture of me that my husband took at Lafitte’s Bar in New Orleans on Bourbon Street. I will be including that in a blog entry in the near-future. However, my trip to Houmas House and the weirdness there did not end with this photo. Read my next entry to find out what happened to me as my husband and I were walking through the gardens after the house tour. The next blog entry after this one is entitled, “Time Warp …” and has some lovely pictures that I took there. That home is so gorgeous that I think it’s literally impossible to take a bad picture there. Previous A Possible Time Warp in the Gardens at Houmas House? ?